By providing spiritual growth through worship, retreats, and a supportive community of fellow students, mentors, and instructors. These are the tools Diakonia uses to help equip God’s people for service in parish and neighborhood ministries. The primary theme and focus of the Diakonia experience is the word of Jesus in scripture (e.g. Mark 10:43): “Let the one who would be great among you be your servant (Greek: Diakonos). Learn more about Diakonia by clicking the topics below. What is the emphasis of Diakonia? Diakonia emphasizes the baptismal vocation of all Christians to serve as did our Lord Jesus. Participants are usually already leaders in their parishes, and have a high degree of commitment to the ministry of the Church. 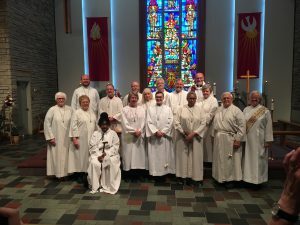 They want to deepen their life of faith and ground their baptismal commitment to serve in the scriptural, theological, liturgical, and historical traditions of the Church. They are committed to serve through the Church in a variety of ways: teaching, administration, liturgical leadership, action for social justice, evangelism, visitation of the sick, community organization, youth work, ministry among the elderly, and the like. In every way they seek, and are helped by diakonia, to grow closer to the image and example of Christ the servant. The diakonia curriculum consists of twelve courses, six per academic year. Each course is 5 sessions in length, and meets weekly for 3 hour sessions. Weekly assignments and reading reflect the twin purposes of relating subject matter to the students’ context of life and ministry (family, parish, neighborhood area of ministry), and of giving a solid background to the topic. Students work at their own level, and assignments reflect the understanding that students are already busy in their families, jobs, and parish. Typically, students average approximately two to five hours of studies per week in addition to class time. How much does diakonia cost?Tuition: Tuition will be $360 (each year for the two-year program). Tuition may be paid by class. Diakonia has a financial aid program. Books: Actual costs vary from course to course, but instructors try to provide materials for $25 or less per course. Retreats: The number of retreats is determined by year, normally there is one. Recent retreats have cost participants approximately $65 per weekend. Fees: A nonrefundable registration fee of $25 is required at the time of registration. An additional fee of $25 at the conclusion of the program covers graduation expenses, including the presentation of a commemorative diakonia cross.